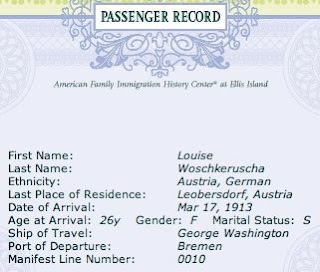 Louise Woschkeruscha, my maternal grandmother, boarded the S.S. George Washington on March 8, 1913, a month after leaving three years of paid apprenticeship and another three years as journey-woman in the Viennese clothing salon of master dressmaker, Elise Vogel. Louise arrived in New York Harbor nine days later. 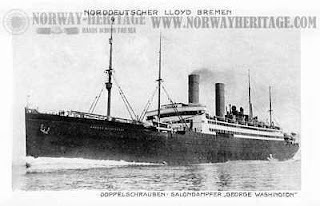 She planned to meet up with her brother, Hans, who had left the year before on the very same ship, entering the United States on May 23, 1912, a century ago. 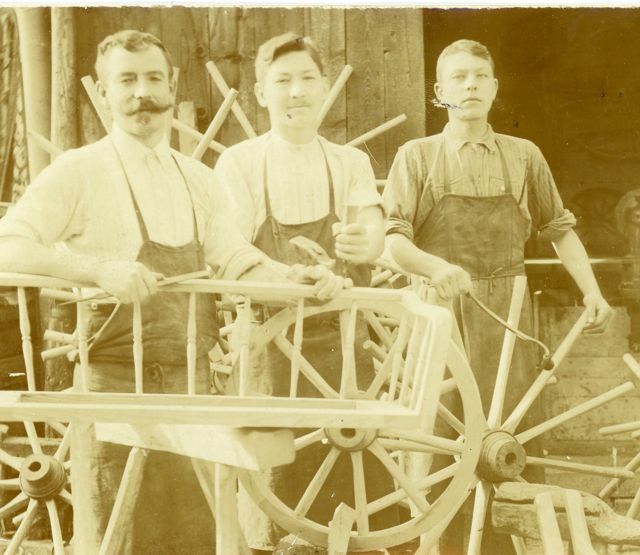 Leaving his abusive and hated father behind, Hans arrived with the skills of a wagon maker and carpenter, giving him an edge over the mostly unskilled immigrants pouring into the country at the same time. I assume Louise moved in with her brother, but I can't say for certain. 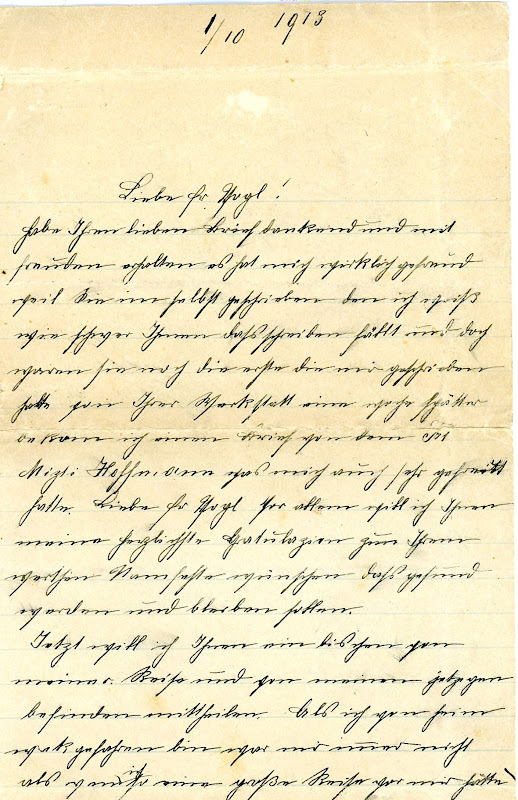 A few months later, in October of 1913, she wrote a letter to Frau Vogel about her new life, starting with her voyage across the Atlantic. The contents make it clear they had corresponded before, but unlike my paternal grandmother who saved every letter, this is one of just a couple of missives I have from or to Louise (and why I have a letter Louise wrote, is a puzzle). Here are excerpts from that letter. I have received your letter with thanks and joy, I was really very pleased that you wrote yourself because I know how hard writing is for you, and yet you were the first one who has [written me]. Now I want to tell you a little about my journey and how I’m doing. When I left home, I didn’t realize what a huge trip I had ahead of me. I had absolutely no fear when I saw the enormous water, and did not become sick at all. You cannot really become fearful. First there is always entertainment on the ship: evening concerts, and by day there are varied games, like one might play at a party. Very nice people are there so that I was never scared. After her arrival, Louise was cheerful and optimistic about her prospects. I can hardly believe I’m in America! [After arriving in New York], we had to travel two days and two nights in 2nd class on the fast train [to Chicago]. Everyone spoke only English and I couldn’t understand a word. That struck me as so funny, I laughed and laughed. I really had fun on the trip so that I hardly had any homesickness. Louise rested up for one week before placing an ad in the newspaper, marketing her skills as a dressmaker. She continued her letter, describing the Parisian styles of fine clothing she is creating. It sounds like a very exclusive dress-making shop. I immediately got a job, where I am now. We make only silk and lace dresses, and some of the dresses cost $100! We make them just like the crazy fashions in Paris chic. In America, people wear a lot of red. The vests and the blouses are heavily gathered at the top and are worn under the hips. The widths are 28-30 by American measure, which is about 80-90cm in our measure. I still don't know English because I work with Germans and only German is spoken. From October 6 on, I'll go to evening school....When I know some English, I would like to earn a little more. Evenings I go to the cinema and Sunday afternoons to the German concert. 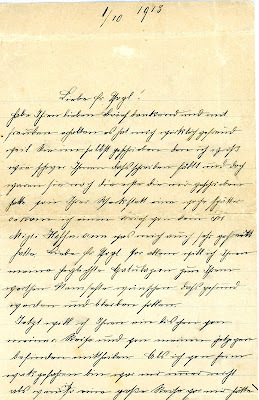 You write me, dear Frau Vogel, whether I'm afraid. Still never. I would only like to have my parents here. You'd really have to search throughout America to find such a woman as my mother! I end my writing and hope that it finds you in the best of health. Heartfelt greetings from your former, thankful worker, Luisa. 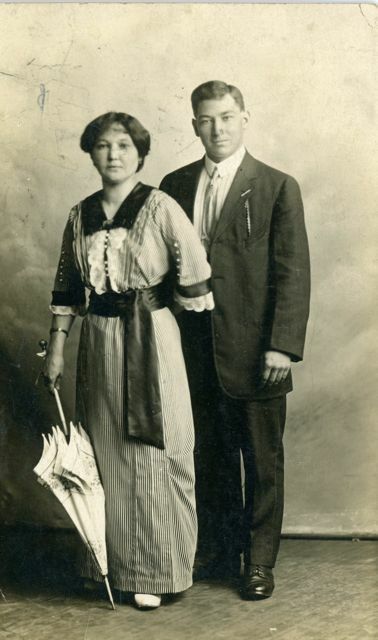 Louise undoubtedly met many young German-speaking men at the concerts she attended, perhaps even at the cinema, but it would be several years before she found a man whose affections she felt she could trust, given her smallpox-scarred face. 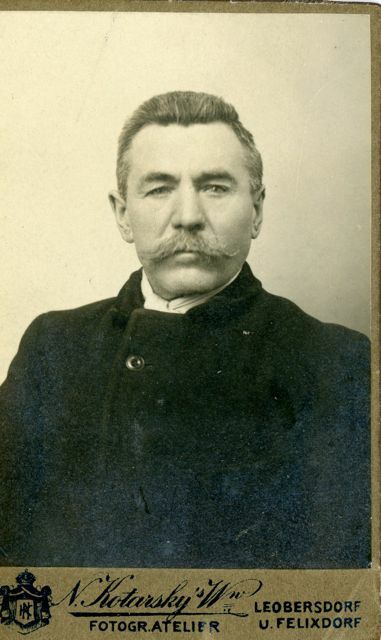 Next week we'll meet that man––John Koroschetz, also from Austria, who had his own tale of physical––and emotional loss. P.S. 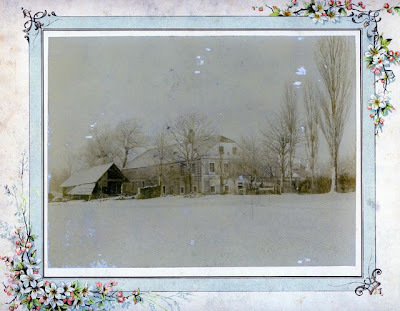 If you missed the interview with me that gives the backstory on this blog go to this link Digging Up Family History or to the previous post, to learn more about the interviewer, Joan Brunwasser. "Hey, Linda! What have you been up to, lately?" Joan, a fellow-swimmer at our local YMCA asked me recently. So unfolded my tale of discovery and obsession of the last decade: getting to know dead people in ways I never had in life. Of course, I'm talking about the vast trove of family history that feeds this blog. A couple weeks later, dressing in the Y locker room, she said, "Linda, I I'm hooked on your blog!" 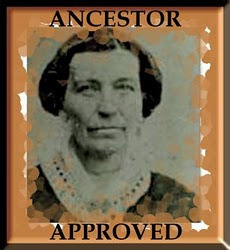 She asked to interview me about the backstory to how Family Archaeologist came about. Thanks, Joan! Joan has been Election Integrity Editor since 2005 for Op-Ed News.com, a source of wide-ranging news stories and opinions with a progressive bent. She co-founded Citizens for Election reform in 2005. The goal, stated on her OpEd News profile page is "to restore fair, accurate, transparent, secure elections where votes are cast in private and counted in public." Joan has conducted more than 560 interviews for Op-EdNews.com, with artists, politicians, environmental activists, film-makers, writers––you get the idea, all sorts of people who work in every facet of human endeavor. 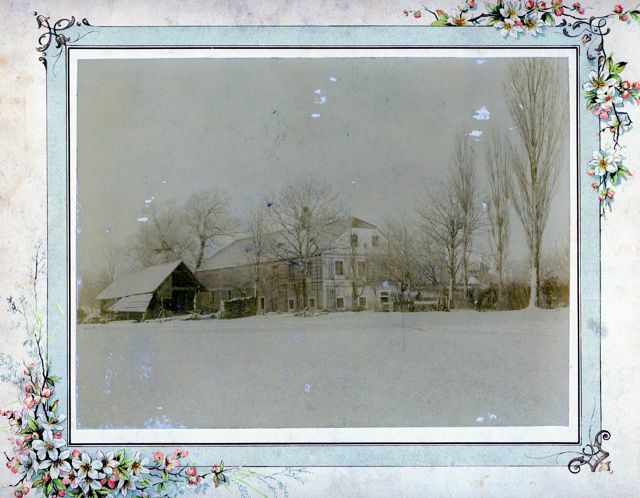 Here's Joan's interview about how this blog came to be: Digging up Family History. 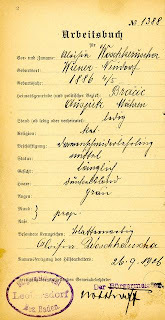 She received her beautiful "diploma," the Lehrbrief, shown in the last post, A Pock-marked resume, signed by both Vogel and the Director of Vienna's Dressmaker's Collective (union or guild), and was now declared to be a Gehilferin, an assistant, like moving to the "Journey-woman" stage. She was now certified or "licensed," to work in any dress shop. She stayed on as Frau Vogel's assistant in her Viennese Dress Salon. The director of the Dressmakers' Association also noted in Louise's Arbeitsbuch that Louise had successfully completed her apprenticeship. 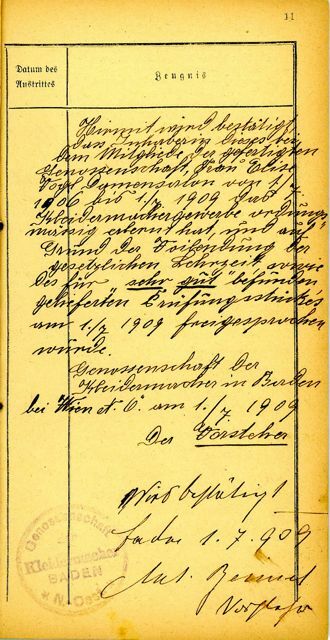 The Arbetisbuch entry (below, right) was important, because that is the "resume" she'd show to potential employers, rather than the huge (about 12 X 17) diploma (Lehrbrief). and overlapping material festooned with tiny bows. Louise worked in Frau Vogel's dress shop for the next three years. In 1912, Louise created her Masterpiece, the dress pictured above and in the close-ups. Elegant and detailed, her gorgeous dress shows off the wide range of skills she had acquired in six years of training. The material she chose is flowered. She continues the flower theme in the rosettes that edge the high collar. 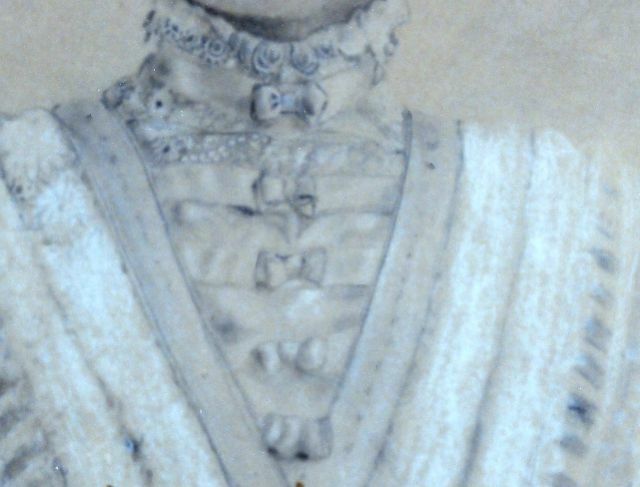 Pearls are festooned down the chest which is V-framed in what appears to be lace. Pearls splash the peaked waistband. I'm no seamstress, so I'm not even sure how to describe the tucks and overlaps that appear on the bodice, sleeves, and neckline. Every detail testifies to her creativity, workmanship, and eye for beauty. I have little doubt it was the finest in the class, as Louise always contended, but her dress was awarded second place. According to Louise, first place had to go to the mayor's daughter. If Louise's description of a "competition" is accurate, then other young women from her class must have also stayed on to complete their training in the Vogel Dress Salon as "Journey-women." 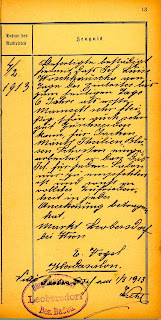 Because this photograph/pencil drawing (an artist penciled in detail to the original photograph) is dated 1912, it had to have been created at the very end of her work with Frau Vogel, who then wrote a Zeugnis, "Recommendation" into Louise's Arbeitsbuch (resume book), shown right, on page 13. Louise left the salon on February 2, 1913, and Elise Vogel wrote her recommendation a month later, on March 1, 1913. 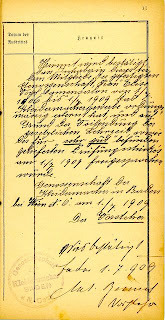 The undersigned confirms herewith that Miss Luise Woschkeruscha, from the date of entry [noted as 7/1/1909] to this date, six years, has worked very industriously and has also learned to beautifully tailor jackets, coats, bodices/corsettes, [and] skirts so that this young woman is recommended to any [dressmaking] Salon and has conducted herself to the fullest satisfaction in every respect [for this] recognition. Louise must have already had her plans in place to leave for America when this recommendation was written, for in less than two weeks, that's just what she'd do. Next week: Louise takes her skills to Chicago. I first introduced my maternal grandmother last year at this post for Women’s history month, 2012: Dressmaker Extraordinaire. There you’ll find cool details which I will summarize here. Alöisia Woschkeruscha, was known casually as Luise in Austria (Louise, later in America). Louise was born on May 4, 1896, in Wiener-Neudorf, Austria. Her family later moved to the small town of Leobersdorf, about twelve miles south of Vienna, where she grew up. 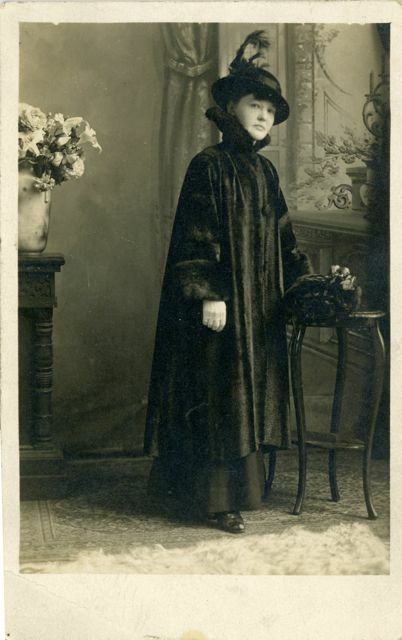 Before her brother, Hans/John was born in 1892, Louise had a younger sister. Both girls, I believe under the age of five, contracted smallpox. As they burned with fever, dimpled pustules covering their little bodies, their father, Johann, ran through the night to fetch a doctor, but it was too late for Louise’s younger sister. She died of the disease. Who knows whether that loss propelled her father, Johann, into a depression, feeding his alcoholism and abusive behavior toward his wife and son, Hans, about whom I wrote in the last post. (Anger begets anger). Louise survived, but her face was pitted with deep pox scars. Louise was painfully self-conscious of her marred appearance and forever thought of herself as ugly because of her facial wounds. 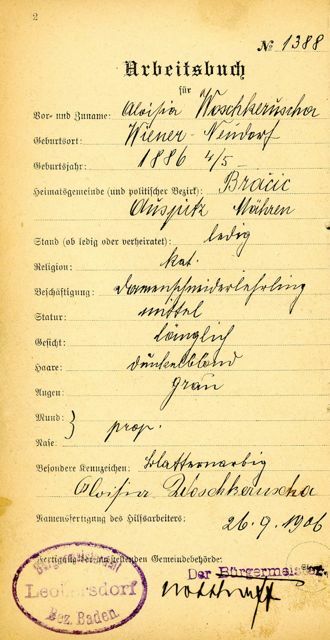 Even Louise’s Abeitsbuch (literally her “Work-book,” a kind of resume and identification document), was a bitter reminder of her ruined skin. On the first page, left, she’s described to be of medium stature, with grey eyes, and dark-blond hair. Her face is described as "longish," and her nose and mouth are "proportional." But it’s the “noticeable marks,” entry that makes me cringe. It's filled in with "pox scars!" I'm horrified by the casual cruelty of this basic document––the shame Louise must have felt every time she presented her work history/ identification. Louise decided to study dressmaking. Was it her self-perception that drove her to want a career, thinking that no one would marry a woman with a pitted face, and she would need to make her own way in the world? Perhaps she was just ambitious and wanted a career. Whichever is the case, she discovered she had immense talent. 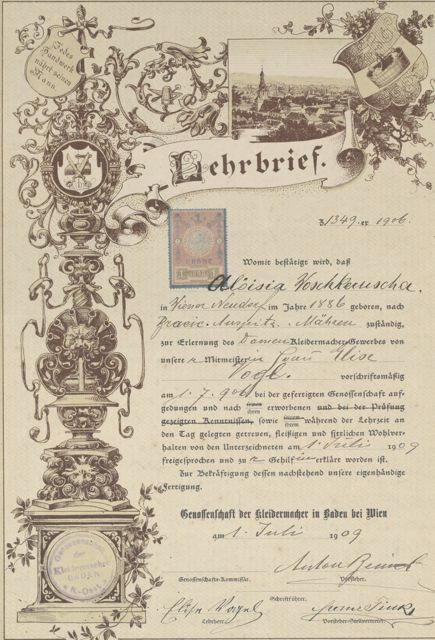 The Lehrbrief, below, translates to "apprentice certificate," but it actually is like a diploma and recommendation, declaring that Louise has finished her apprenticeship. The translation was tricky because so many words are from another era, so I originally thought it was the start of her apprenticeship. My friends in Germany helped me get it straight. You can see the beautiful details of this document, including a naked couple in a hot tub (! )(upper right) at Dressmaker Extraordinaire, where you'll also find photos of her crocheting and embroidery samplers, which Louise created at about age eleven). Her completion of this first phase of her dressmaking studies was also entered into her Arbeitsbuch. Both the Lehrbrief and Arbeitsbuch are signed by the same woman: Elise Vogel, her dressmaking instructor, for whom Louise worked for another three years before creating her "masterpiece." 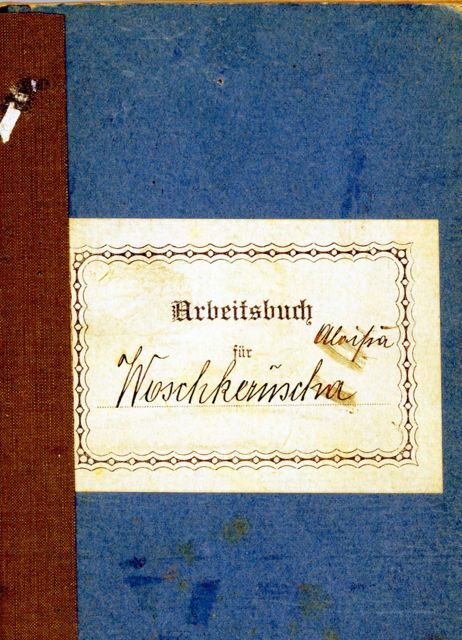 Next week: A peek inside Louise's Arbeitsbuch at the end of her work for Elise Vogel in 1913, the photo of her 1912 Masterpiece, and details of Frau Vogel's recommendation. 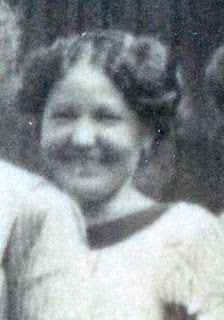 While the origins of Louise's mental illness can't be pinpointed, some facts about her childhood may throw some light the possible origins of her incendiary temper. 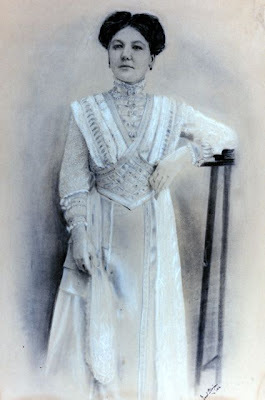 Aloisia (in America, Louise) Woschkeruscha's mother was Therese Müller, daughter of a successful miller and farmer, Paul Müller and his wife, Theresia, nee Blaschka. 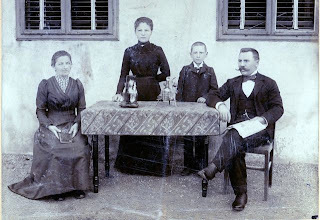 (Couple at left). Paul owned 80 “yokes” of land, the amount of land two oxen, yoked together, could plow in a day, and a flour mill on the Mank River, not far from Vienna, Austria. Neighbors could never figure out how Paul Müller came up with the most creative and innovative approaches to both the skill and business of milling and farming. They didn't know that he sat up late into the night reading a publication called Über Land und Meer (Over Land and Sea) learning the most up-to-date methods to keep ahead of the curve. At a time when many of his peers couldn't even read or write, it gave him a vital edge. 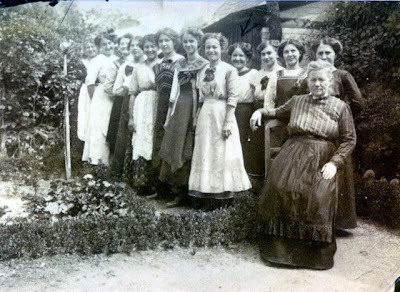 Paul and Theresia's third child was named Therese, (photo left), mother to Aloisia and maternal grandmother to my mother, Lillian. Theresia, Therese's mother, died in childbirth, but it's not clear if she died giving birth to Therese or a later child. Paul remarried, but his second wife died in childbirth too. 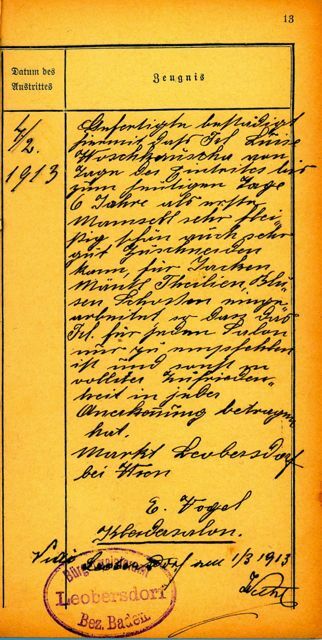 He then married a third time, to a woman, whom I believe was Anna, based on a funeral card we have in the collection. She was lucky enough to live to age 68. 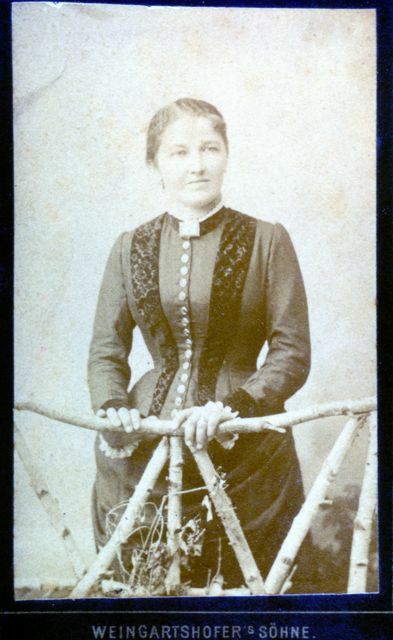 As a young woman, Theresia met Johann Woschkeruscha, a handsome wagonmaker. 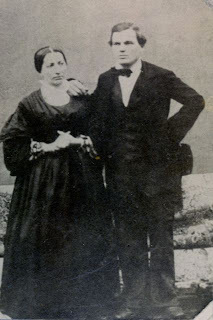 Family lore has it that Johann seduced Therese Müller as a way to wheedle his way into her family money. My mother told me that the butcher in town begged Therese not to marry Johann. He, the butcher, loved her and didn’t care if she was pregnant with Johann’s child. It's unclear to me if Therese loved Johann or just felt the child should be raised with her biological father. Whatever the reason for her decision, their differences in class and ethnicity infused their marriage and family life with tension and violence. Johann apparently seethed over his inferior status. He would get drunk at a local bar and his fellow Bohemians would taunt him, “You let that German woman push you around? You should do something about her!” So he did. Drunk and embittered, he went home and beat his 4' 11" wife. He also beat Aloisia's younger brother, whom I'll call by his Americanized name, John, to keep him straight from his dad. John also trained as a wagon maker, like his father. I knew "Uncle John," my mother's uncle, here in America. Decades after leaving Austria, he could never speak of his father without shaking with rage, his face darkening, his voice quavering. Family lore has it he ran away from home at the age of fifteen. Whether that age is correct, I'm not certain, but I do know, based on Ellis Island's ship manifest, that John was twenty when he boarded the S.S. George Washington in Bremen on May 4, 1912, and arrived in New York on May 13th, destined for Chicago. He changed his name from Johann (Hans) Woschkeruscha to "John Miller," using his maternal grandfather's Americanized surname, to erase the familial connection to the man who had abused him. I never heard that Johann, the father, beat Louise, but it’s pretty clear that she grew up in a home where violence was common and self-control in short supply. She, too, would develop a volatile temper. Next week we'll learn more about Louise's childhood, her career as a dressmaker, and the disease that scarred her face and psyche.